Coach Springer presents these excellent defensive rotation into transition basketball drills. Diagram A. 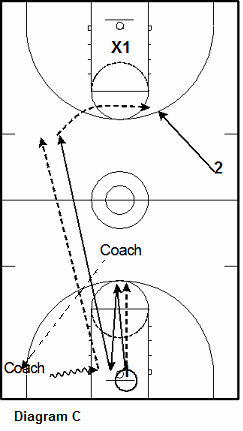 Player passes to a coach at the point and closes out on the coach. Coach then passes to a coach or assistant in the corner and the player drops into helpside in the paint, getting as low as the ball. 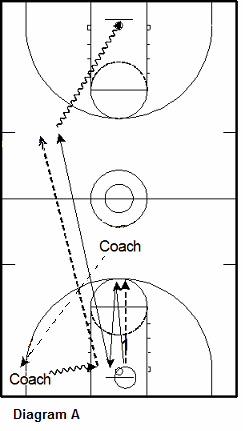 Next the corner coach drives and the player walls up and stops the dribble. 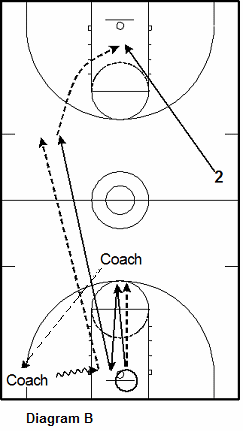 The coach then throws ball down court for the player to chase down, retrieve the ball and score. Diagram B. The drill is the same, except we add a second offensive player coming in from the right wing. Player 1 retrieves the ball and attacks 2-on-0 passing to O2 for a lay-up. Diagram C. Again the drill is the same, but now we add a defender so that the drill ends with a 2-on-1 situation.